J.C. de Swaan, lecturer at Princeton University and partner at Cornwall Capital, recalls that for the past several years Bogle has frequently visited de Swaan’s class of first-year students at Princeton. 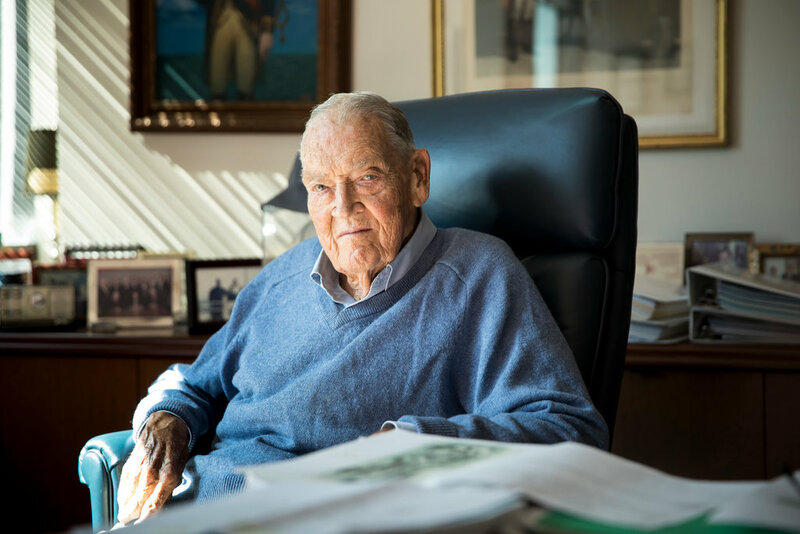 Bogle’s deep voice and high energy would often startle the students, as he blasted the asset management industry with his mantras Too much costs, not enough value and Too much salesmanship, not enough stewardship. Bogle also bemoaned an eroding sense of professionalism, lamenting that financial management in many cases prizes speculation over sound, long-term investment. As de Swaan observes, research studies have abundantly confirmed Bogle’s 1950 observation for several decades. In 1974, Nobel laureate Paul Samuelson found that there was no evidence that equity fund managers could consistently outperform the market averages. He concluded his analysis with the quip, “Perhaps there really are managers who can outperform the market consistently — logic would suggest that they exist. But they are remarkably well-hidden.” Charles Ellis’s 1974 study found the same thing. Princeton’s Burt Malkiel publicly called for the creation of index-tracking mutual funds in his best-selling book A Random Walk Down Wall Street. But it was Bogle who put the plan into action by founding Vanguard in 1975, and in doing so changed investment history. Today, Vanguard Funds manages over US$5 trillion, mostly in low-fee index-tracking mutual funds and exchange-traded funds. Vanguard’s S&P 500 ETF (VOO) has $400 billion in assets, while Vanguard’s Total U.S. Stock Market ETF (VTI) has $670 billion in assets. The management fee for both funds is only 0.04%, a far cry from the 0.5% to 1% assessed for many actively managed funds. One of Vanguard’s recent offerings is (ESGV), which tracks an index of U.S. stocks screened for environmental, social and corporate governance criteria. Its management fee is somewhat greater (0.12%), but still much lower than most comparable offerings. After ignoring Vanguard’s low-fee index-tracking approach for many years, other major brokerage houses are now racing to compete, offering low-fee index-tracking funds of their own. The Schwab US Broad Market ETF (SCHB) has a 0.03% fee, while Fidelity offers four index-tracking mutual funds with zero fees. The biggest risk investors face is not stock market volatility, but not investing in the first place. Investing — as opposed to simply saving — is necessary to generate a reasonable return. Investing is a virtuous habit best started as early as possible. Enjoy the ‘magic’ of compounding returns. Even modest investments made in one’s early 20s can grow to staggering amounts over the course of an investment lifetime. Eliminate emotion from your investment programme. Have rational expectations for future returns, and avoid changing those expectations in response to the ephemeral noise coming from Wall Street. Avoid acting on what may appear to be unique insights that are in fact shared by millions of others. Regardless of what happens in the markets, stick to your investment programme. Changing your strategy at the wrong time can be the single most devastating mistake you can make as an investor. Just ask investors who moved a significant portion of their portfolio to cash during the depths of the global financial crisis of 2007-2008, only to miss out on part or even all of the subsequent eight-year … bull market. How could so many highly skilled, highly paid securities analysts and researchers have failed to question the toxic-filled, leveraged balance sheets of Citigroup and other leading banks and investment banks [prior to the 2008 bear market]? My ideas are very simple. … In investing, you get what you don’t pay for. Costs matter. So intelligent investors will use low-cost index funds to build a diversified portfolio of stocks and bonds, and they will stay the course. And they won’t be foolish enough to think that they can consistently outsmart the market.